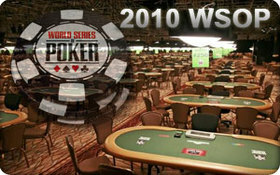 After 12 hours of play Day 6 of the 2010 World Series of Poker Main Event has been complete with Danish professional poker player Theo Jorgensen leading the pack. At noon, Las Vegas time, on Thursday the 205 surviving players returned to The Rio Hotel and Casino each with a realistic chance of winning poker’s most coveted tournament and the staggering $8,944,138 first prize money. By the close of play only 78 players had chips remaining, meaning each of them were guaranteed to walk away with no less than $94,942. All eyes were on Johnny Chan when the tournament began, as the 10-time WSOP bracelet and back-to-back Main Event winner was making another deep run. Early in the day he entered a raising war with Robert Pisano, which resulted in Pisano being all-in. Chan revealed KhKc but Pisano held AsAc and when the board ran out 4dTd5s7c4h, Chan was down to just 800,000 chips. Not long after he found a pair of jacks in the cutoff seat and moved all-in for 550,000 chips when the action folded around to him. Jonathan Driscoll in the button snap-called and flipped over another pair of aces! The board failed to improve either player and Chan left for the cashier’s desk to collect $57,102 to a round of applause from players and railbirds alike. Michael Mizrachi was chip leader for a large percentage of the day, finishing up in second place with a 7,535,000 stack. Mizrachi has been on a real heater at this year’s WSOP, winning a bracelet in the $50,000 Poker Player’s Championship and winning a total of $1,677,727 thus far. He was overtaken for the chip lead by Theo Jorgensen late on in proceedings. Jorgensen will return to the felt on Friday armed with 9,300,000 chips and a real chance of winning his second gold bracelet. His first came in 2008 at the World Series of Poker Europe when he defeated Sorel Mizzi heads-up in the £5,000 Pot-limit Omaha event for a cool £218,626. In May this year, Jorgensen won his first World Poker Tour event when he was victorious in the €10,000 WPT Grand Prix de Paris, worth €638,377. When not playing tournaments Jorgensen can be found playing poker cash games, as high as $200/$400, online. Play resumes at 1200 noon Las Vegas time and will continue until only 27 players have chips in front of them, meaning each player will then be guaranteed at least $317,161. This entry was posted on Friday, July 16th, 2010 at 10:16 am and is filed under Poker News. You can follow any responses to this entry through the RSS 2.0 feed. You can leave a response, or trackback from your own site.